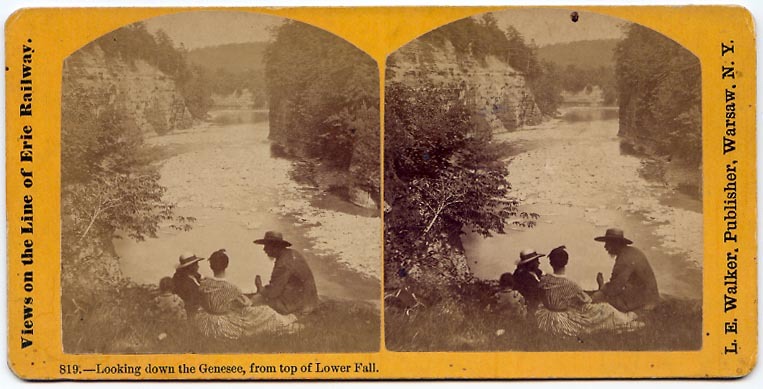 "819.-Looking down the Genesee, from top of Lower Fall." 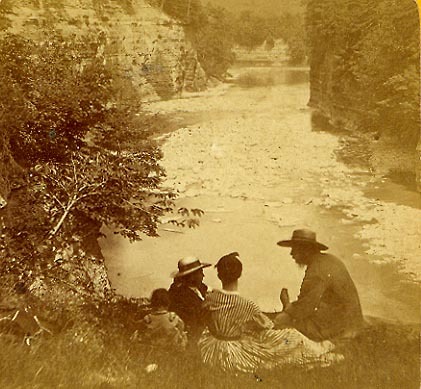 "Views on the Line of Erie Railway"
A group of visitors rest VERY near the edge of Table Rock near the Lower Falls. The photographer was set up behind them and had his camera turned down stream toward the north. Note the little child in the group - the man, possibly the father, is strategically placed between the toddler and the edge of the gorge. There were few walls and fences in those days to prevent tourists from getting too close to the edge! The Flume and Sugar Loaf are not visible - they would be to the right of the group. A slightly larger image is found below.